Beg For Mercy by Jami Alden definitely has a very engrossing plot line. At the beginning of the book is a flashback from two years before the events of the book take place – Megan’s brother Sean is arrested for murder, but Megan is convinced he is innocent. The kicker? The arresting officer was Megan’s boyfriend. Fast-forward to the present, Megan is extremely involved in trying to clear her brother’s name – her brother on Death Row. Can she finally stumble upon evidence that’ll make her ex-boyfriend, Detective Cole Williams, actually take her seriously? Will she be able to handle working with him if she does? The book was very graphic…the violence and sexytimes both. I don’t mean that as a critique, just an observation. It gave the book a deep sense of very raw emotion. Grittier than a lot of other romantic suspense. Megan’s very real feelings of both guilty lust and still-churning anger when is around Cole is very realistic and intense, definitely made their interactions and growing intimacy feel legitimate. Megan’s intensity and desperation to clear her brother’s name reached the point of near-madness. But hard on the heels of my twinges of annoyance was the question: can I really blame her? So, even though the repetitive theme of her constantly throwing herself into unbelievably crazy situations wore on me a little, I couldn’t actually fault her character’s intentions. I’m extremely relieved that Jami Alden had a developing relationship between Megan & Cole even before her brother’s arrest. Normally I strongly prefer getting to experience the MCs meeting for the first time, with no baggage between them before the book starts. In this case, however, their relationship would have made zero sense if they’d just met because of Sean’s case. The desperation bordering on lunacy I already described basically dominated Megan’s personality post-arrest. No way could their relationship have believably developed from scratch under those circumstances. Since they’d already had a strong connection previously, Cole’s willingness to deal with her not only made sense, but made him strong swoon-candidate material. 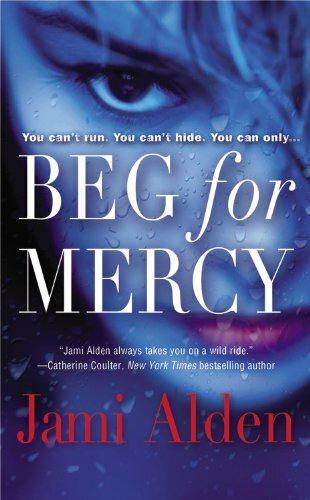 The actual mystery in Beg For Mercy – having current murders that possibly tie in to the past requires a tiny bit of suspension of disbelief in the beginning – but just go with it. It quickly becomes very interesting and complex. Even though it isn’t too difficult to figure out whodunit, my interest never lagged in the steps it took the characters to get there. So, overall, I definitely recommend reading this if you’re a fan of romantic suspense. Jami Alden has another completed trilogy published, and I will be checking into it while I wait for the next book of this series! I love romance books add a little mystery and I'm in. Nice review. I do like romantic suspense, but hard to find a good one. Usually good romance, bad suspense, or vice versa.